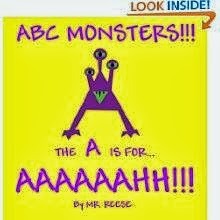 Mr. Reese, Puzzles, Enigmas, and Conundrums: ABC MONSTERS BOOK FOR SALE NOW!!! ABC MONSTERS BOOK FOR SALE NOW!!! Hello there, Mr. Reese. I'm so happy to have met you through your phenomenal improv performance this weekend. My darling nieces will be over the moon with this adorably-illustrated book! Would you be interested in answering a few questions for the #MyWritingProcess blog tour? If so, please hit me up at viviennemathews [at] live [dot] com for more information, questions, and posting dates.